From the alluring island of Puerto Rico and the vibrant city of San Juan, the Caribe Hilton beckons to those longing to escape the ordinary. With tranquil waves lapping at the shore of the secluded beach and seductive tradewinds swaying into 17 acres of exotic gardens, guests will come to understand why this AAA Four Diamond award-winning San Juan beach resort is where ordinary ceases to exist and paradise never ends. 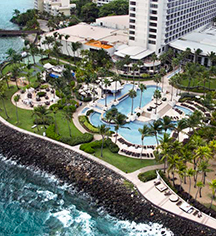 Conveniently located only 15 minutes from Luis Muñoz Marin Airport and a short drive from Old San Juan and the Condado area, the Caribe Hilton hotel offers everything needed for an unforgettable stay, whether a guest is in San Juan for business or for pleasure. Featuring a secluded beach, oceanfront swimming pools, nine restaurants, a full-service spa, and 65,000 sq ft of meeting space, the historic Caribe Hilton boasts the ultimate Caribbean experience. 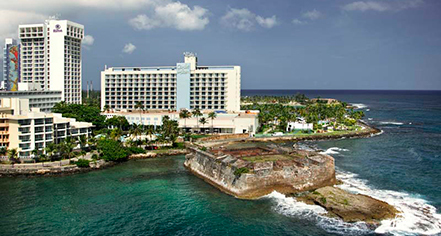 Caribe Hilton, a member of Historic Hotels Worldwide since 2015, dates back to 1949. The Piña Colada was invented and first served at the hotel's Beachcombers Bar on August 15, 1954 by bartender Ramon “Monchito” Marrero. Early Check-In/Late Check-Out: Early Departure Fee: Subject to change depending on season. Late Check-Out Fee: Subject to change depending on season. Extra Person Fees: $45 per person. Hotel/Resort Fees & Taxes: 18% (plus sales tax 11.5%) Daily Resort Charge will be added to the room rate and includes: pool access, beach towels, fitness center access, Children’s club/arcade access, in-room safe, in-room coffee. This charge is in addition to the rate quoted and is not a government imposed charge. Room tax: 9%. Occupancy Restrictions: Double bed room accommadations up to 4 people and in king sized bed accommodations up to 2 people. Parking: Self-parking: $21.00 (Multi-Level Parking). Valet parking: $28.00 (Valet Parking). Secured: Available. Covered: Available. In/Out Privileges: Available. Other Parking Information: Visitor hourly self/valet parking rates available. From the alluring island of Puerto Rico and the vibrant city of San Juan, the Caribe Hilton beckons to those longing to escape the ordinary. Learn more about the History of Caribe Hilton .